Over four intense days, representatives from communities, conservation, human rights and government engaged in a Global Dialogue on Human Rights and Biodiversity Conservation. Held November 20 to 23, it was co-organised and co-facilitated by SwedBio, FPP, Natural Justice and CIPDP (the NGO of the Ogiek of Chepkitale, Mt Elgon, Kenya). The dialogue, rescheduled from October to November due to the Kenyan Presidential election re-run, had to relocate from Kitale to Eldoret due to the World Health Organisation’s precautionary advice in relation to the Marburg virus. This WHO advice also meant that the planned visit to Mt Elgon with the Ogiek community had to be replaced by a day dedicated to hearing from communities through film, presentations, song, dance, and discussion. 1. From the Ogiek of Chepkitale, Mt Elgon, Kenya, we heard of years of harassment and evictions, of their participating with so many in Kenya in pushing for the 2010 Constitution with its recognition of human rights, including their rights to their lands. They spoke of how the dialogue with state and non-state conservation agencies initiated by the 2011 Whakatane Assessment had led to a reduction in harassment, regaining of schools that were formerly forbidden, and the recognition that they are a community like any other. They also spoke of how hard it has been to make progress in securing their community’s land rights, with homes burnt by Kenya Forest Service as recently as 2016, despite their rights enshrined in Article 63.2.d.ii of the Constitution, and despite the fact that so many, including Kenya Wildlife Service (KWS) recognise that they are conserving their lands so effectively. For example, according to KWS, elephants spend 80% of their time on Ogiek community land where they feel safer from poachers than they do in the national park. 3. From Uganda and from DRC we heard similar stories from the Batwa about being evicted from their ancestral lands, no longer having even access rights in these national parks, and now trying to survive in intense poverty. For the Batwa in Uganda, evicted from Bwindi and Mgahinga National Parks, this means being scattered so that even their language is disappearing as the impact of exclusionary conservation policies become ethnocidal. For the 9,608 Batwa now living in 101 villages on the edges of Kahuzi-Biega National Park in DRC, their entering their ancestral lands can have fatal consequences, with one youth recently killed by eco-guards while gathering medicinal plants. 4. From Australia, we heard about how Land Rights and Native Title legislation has returned large areas of Australia to Indigenous Traditional Owners, and given decision-making powers to indigenous communities to enter into non-legal, voluntary Indigenous Protected Area (IPA) agreements with the Australian Government; which are then recognised by all tiers of government as part of the National Reserve System. IPAs are not restricted to exclusive possession native title lands. They can also be applied to a range of tenures. About 52% of Australia is currently covered by some form of indigenous tenure. For native title, people have to demonstrate pre-existing connection to the land, but because under colonisation so many were forced off their lands, many cannot now show that they have a connection to the land, and so they cannot claim, or have recognised, their native title rights. There are many more IPAs in the in the central and western deserts regions, and across northern Australia, perhaps partly because colonialism was far less impactful here. They (IPAs) can also be applied to a range of tenures including Aboriginal freehold, leasehold (eg Indigenous Land Corporation properties), Indigenous Land Use Agreement lands, jurisdictional protected areas including co-managed (example State/Territory National Parks and Marine Parks) and even private property. Many newly dedicated IPAs extend over multiple tenures which can also include sea country. 5. We watched a powerful film that Elias Kimaiyo, a Sengwer of Embobut Forest, Kenya, had helped make about their plight, heard about his being wounded by Kenya Forest Service (KFS) guards while trying to gather evidence of their burning of Sengwer homes, school books, bedding, etc. 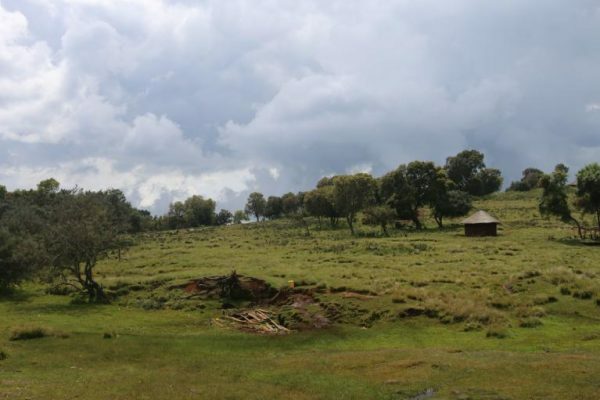 The Sengwer asked for help to try and stop the EU WaTER project that is providing funding for KFS to carry out its activities, and were clear that those running the project seem completely unwilling to implement the rights-based, constitution-compliant, science-informed, customary approach to forest conservation that the Sengwer have proposed. One where securing customary tenure is recognised as the prerequisite for the only sure way of securing rights and the forests, and therefore regulating the flow of water to downstream communities and to Kenya at large. After these presentations there were strong discussions, with some people whose work focuses on biodiversity and conservation clearly deeply moved and shaken by the evidence that conservation so often punishes the very communities who have sustained biodiversity. The following day we returned to the 3 underlying questions of why these conflicts still arise, how to avoid them happening, and how active conflicts might be resolved. While there has been huge progress on paper in terms of conservation organisations policies and targets since Durban in 2003, and huge progress in terms of scientific studies demonstrating that securing the collective tenure rights of ancestral forest communities is a far more reliable (let alone just) way of protecting indigenous forest than state agencies imposing state protected areas, there has been very little positive change, and many negative ones, for the communities on the ground. Since 2003 there has been a focus on trying to ensure that conservation takes the rights, responsibilities and abilities of communities seriously. However, perhaps the real reason why this has not happened is because – as was discussed at the global dialogue – the real underlying conflict is not between conservation objectives and community’s rights. These either are, or can become, compatible and mutually reinforcing. As identified in the dialogue, the real conflict that needs addressing is between, on the one hand, communities and conservation, and, on the other, powerful forces that exploit and marginalise both communities and ecologies for their own self-interest. To recognise this underlying dynamic is to recognise the elephant in the room – which in the case of the global dialogue was partly evident in the absence of so many who had been invited from government and from international donors. When conservation becomes a means in the hands of those with power to enable them to take over communities’ territories, then its focus is on appropriating natural resources from the very communities who have been protecting them. To highlight this underlying dynamic, and to recognise how much this focus is missing from current discussions, is not to suggest we wait for systemic change (however much that is needed) before we address these matters, but to recognise that our interventions to secure ecologies and societies need to be informed by such an analysis if each incremental step we take is going to help take us in the right direction – towards the mutual needs of ecologies and societies – rather than be used to further deepen that division, and that appropriation. Answers to the question of “What can be done to avoid conflicts occurring?” include the need to recognise the power relations at play, and to act to stop the exploitation of the marginalised by the powerful. More specifically this requires conservation actors to resist being pawns in the disempowerment of communities, and to stop believing that their supposed short term ‘gain’ from imposing a strict protected area will lead to sustainable conservation. This analysis and commitment can be aided, but not replaced, by developing clearer guidance for conservation organisations and governments on how they undertake the process of recognising communities’ rights, including recognising their right to FPIC, the right to give or withhold their consent. Answers to “How can active conflicts be resolved?” included the need for effective grievance mechanisms, as sought by Durban’s Target 10 in 2003. Yet, it was only in 2011 that IUCN established the Whakatane Mechanism to help undertake this. Since then, despite positive motions passed at subsequent World Conservation Congresses, sufficient resources for only THREE Whakatane Assessments have been forthcoming. Given the thousands of protected areas established without the consent of the indigenous and local peoples whose land they have so often taken, and given the absence of other widespread and effective grievance mechanisms, there has to be serious concern about the need to make such a mechanism so much more resourced and effective, to counteract the huge imbalance in power that is – quite literally – taking the ground from under us. It was telling that at the last minute the UN Special Rapporteur for Indigenous Peoples, Vicky Tauli-Corpuz, was unable to join us. She sent a very powerful and eloquent video presentation, but had just returned from a country mission to Mexico and the fact that she was so visibly exhausted and unable to join us again highlighted the huge imbalance in resources between those who recognise rights as essential to our well-being and those who see them as impediments to their profit. As ever, the best part of the Dialogue was in the stories, whether in the main event, or in the sharing of stories and song and dance in the cultural evening, or in the many one to one meetings focused on addressing particular issues in particular places. Participants hopefully left fully motivated to undertake the hard but rewarding task of addressing the real conflict.